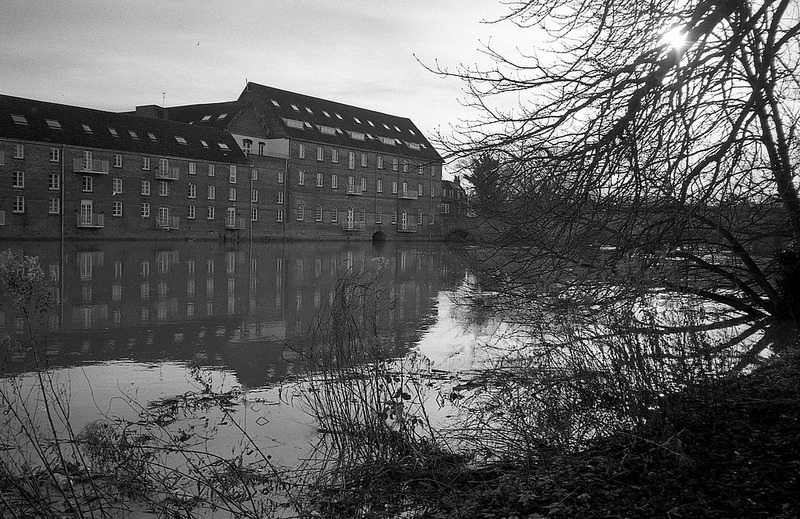 The above photograph is another one from my day trip to Huntingdon with the Yashica T2, and Kodak Tmax 400 film. It shows Huntingdon Mill, across the River Great Ouse. Not too sure how much that I like this one. Ran again today. Intended to make it a shorter run, but it ended up longer - 5.3 miles long. The longest run for these dogs yet, or for me for several years for that matter. Average speed was 5.8 mph, taking 54 minutes, but there were hold ups, particularly near to the primary school, stuck behind mums picking up their kids, and with meeting other dogs. With the dogs, I've run over 47 miles over the past thirty days. Cool. The DNA sampling kit arrived today. For the records, it took under four days for delivery. I sampled with my spit, registered the sample online, then took it back to the Post Office to catch the afternoon return mail. Later on, I completed my profile and registrations on the 23andMe website. I'm really looking forward to the results, and to using the online tools to analyse my DNA sample.